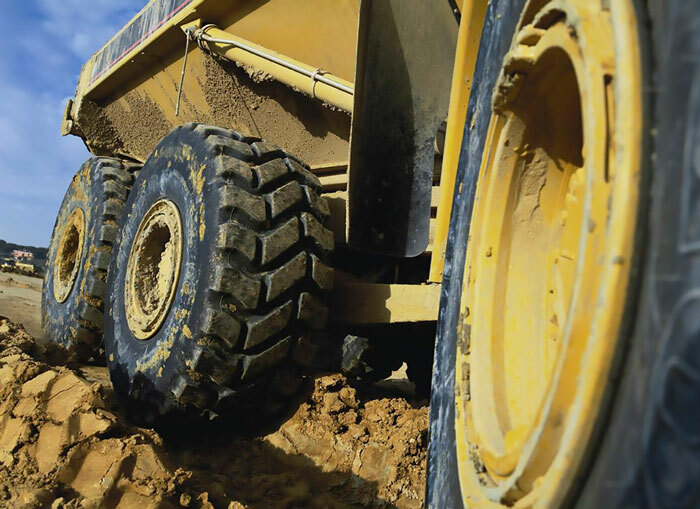 Tires are complex, highly engineered products that can be important contributors to construction equipment productivity. They also account for a substantial capital investment. That’s why it makes sense to do everything you can to ensure that you are using the right tires for your application and that they are performing correctly. Building a database of tire maintenance information is one of the best ways to accomplish this. There are many specific tire performance metrics you should track, starting with inflation levels. Maintaining proper inflation is one of the most effective things you can do to achieve optimal tire performance. Consistent, correct inflation positively impacts tire wear and casing life, as well as overall performance. It also reduces the amount of fuel the machine consumes. Inflation evaluations should be part of your pre-shift equipment checklist. Second, it is important to check tread wear. This includes checking tread depth level and examining patterns for signs of unusual or uneven wear and for nicks or cuts that could grow into larger, deeper separations if left unaddressed. Third, look for mismatched tires. Sometimes, construction companies will unknowingly mount tires that feature two different diameters, which can have a detrimental impact on both equipment and tire performance over time. Take the initiative to make sure that yours are identical in measurement. Identify overlooked or hidden maintenance opportunities—Let’s say that over the course of several fleet surveys, you discover that a tire on a certain wheel is exhibiting non-traditional wear patterns. This could indicate that a tire was not properly inflated or the presence of a condition that is causing the tire to lose air. Under-inflation can cause tires to wear unevenly and/or prematurely. Knowing this, you can perform a closer inspection of the tire, rim or complete wheel assembly, and depending upon the results, take corrective action. Gaining a better handle on tire performance also can help you evaluate, and, if needed, adjust fleet survey and site audit procedures and frequency. It’s important to remember that tire performance can be influenced by underfoot and other environmental conditions, some of which, like the presence of rocks or standing water, can be mitigated. Make sure you’ve selected the most appropriate tire for your application—Good tire performance starts with good tire selection, and the needs of individual machines can differ greatly. For example, equipment that travels across jagged, debris-strewn surfaces might require a tire that primarily offers enhanced cut resistance. A machine that rolls across even, hard-packed terrain might need a tire that offers more service hours, while placing less of a premium on cut or impact resistance. When choosing new tires or evaluating the tires that are already on your machines, consult with your local OTR tire dealer or expert. The right professional is one who has the experience and knowledge to evaluate your tire needs and jobsite conditions, allowing them to identify tires that can provide the lowest overall cost of ownership. Forecast future tire needs more accurately—Maintaining a database of tire-maintenance information helps you monitor the hours that a tire has been in service and more accurately predict when it might need to be replaced. In turn, this can help you manage your tire budget more effectively, with the goal of ultimately lowering your overall operating cost. When tracking tire performance, also note when a tire has been taken out of service or replaced, not forgetting to analyze removed tires. The information gathered through a careful, systematic scrap tire analysis can be used to improve your tire maintenance procedures. Equipment operating conditions are always in flux, and service requirements sometimes change. Tracking tire performance takes vigilance, dedication and time. But, whether you are launching a new tire management program or simply tweaking an existing program, the results of effective construction tire maintenance—in terms of both improved performance and reduced costs—more than make up for the time and effort involved. It’s hard to track how your tire assets are performing without a scorecard of some kind. A tire-management database can help you keep tabs on this critical dynamic and put valuable information in your hands so you can make faster, more educated decisions about your investment. OTR tire veteran Eric Matson is the global field engineering manager for The Goodyear Tire & Rubber Company’s OTR tire business. Visit goodyearotr.com.